Most wedding venues promote wedding packages based on price per guest. When you have a shortlist of wedding venues it can be really difficult to compare costs as this price per guest can include other hidden costs that they don’t advertise. It is really important to be aware of these and check whether they are included before you sign your contract. Latest results show that in Australia the average ‘expected’ budget is $19,295 but most couples are exceeding their expected budget by 50%*. Sticking to a budget can become increasingly difficult when there are extras added to the bill for your wedding reception that you weren’t aware of. Here are the most common hidden costs associated with wedding venues. Put the kettle on, and sit back as there are quite a few to watch out for! Many venues charge for cutting your cake and serving it to guests. There may also be an additional charge for hiring a cake stand and knife. If you are using separate caterers from your venue there may be separate costs for the reception and the pre-reception drinks. Make sure you know these costs upfront. Most of the time this is included in your contract, but it is best to double-check. Your bar staff, wait staff and attendants may all be expecting a tip if it is not included. It is important to make sure that your venue has adequate parking for all of your guests. Most guests do not expect to pay so if your venue doesn’t offer free parking it would be nice to arrange pre-paid parking for your guests. For your evening reception will you be having an open bar, restricted bar or will you expect guests to buy their own drinks? A restricted bar means that you choose selected beers, wines and maybe spirits. If you have an open bar, does this include shots? Will you be supplying your own wine and champagne? It is most definitely a cheaper option if you can get a good deal but make sure you check what the venue’s corkage fee is and add this on to your price per bottle. Some venues have their own chair covers and will provide them at no extra cost. If an external vendor provides them then there will be an additional charge, which will vary depending on the type of material. The same applies to linens and napkins. Check whether your venue includes them in their quote. 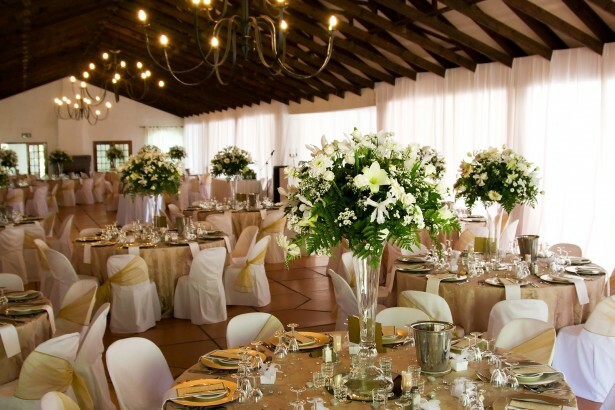 It is common for venues to stipulate minimum numbers for your wedding reception. Make sure that you can meet this minimum quite easily. If the minimum number is 100 for example, but only 90 guests turn up, then you still need to cover the costs of the 10 guests. Check if your venue charges a room hire fee by the hour. You may need access to the venue before the wedding to set up or may want to keep the party going at the end of the night. Make sure you understand if there are any extra charges for doing so. It is really handy to have a secure room where you can store your wedding gifts, honeymoon luggage and bouquets. If your venue provides this make sure it is at no extra cost or is included in the quote. If you are planning a Winter wedding, it is likely your guests will arrive wearing a coat and will need somewhere safe to leave it. Check that your venue has a cloakroom facility and if there are any fees for guests to check their coats.